Do you have a hero in your life? Someone you look up to and admire? Someone whose example you try to follow? Have you considered that you might be someone else’s hero? Are your own actions and decisions worthy of emulation? In 2012 I wrote about choosing heroes carefully. I’m starting this year off by remembering one of my personal heroes. He’s gone now. He passed away December 11, 2013. But most importantly, he was my dad. My most vivid memory of my father is of him working in his shop. I would “work” with my Tonka trucks in the piles of sawdust under his table saw while he crafted yet another project out of wood. He built hope chests, tables, chairs, cabinets, bookshelves, serving trays, toys and more for his family and friends and community. As that pile of sawdust grew so did my admiration for his skill. The cabin cruiser my father built, in particular, turned many heads throughout the years. It was 28’ long, built entirely out of wood and was powered by a 4-cylinder Mercedes diesel that he salvaged out of a 1960s delivery truck. Wherever he went in that boat people would stop and admire it. When, after many years, the boat had to be sold, a marine surveyor was called to inspect it and evaluate its construction. He looked at me with a surprised look and said, “You told me this was a homemade boat. But this is no homemade boat. Your dad was a fine boat builder and this is one fine vessel.” I swelled with pride. My dad had, in fact, commissioned me to drill all the mahogany plugs required to conceal the screw heads. I was probably only 4 or 5 years old at the time but he propped me up behind the drill press on a couple of milk crates and taught me the joys of working with power tools. He taught me how to use the band saw too so I could cut toy machine guns out of plywood for myself and my neighborhood friends. You can probably get charged for encouraging kids to do stuff like that nowadays. His methods may have been slightly unconventional, but my dad was a good teacher and I only cut through my finger once. He had jumped the gun a little when he tried to teach me how to operate a backhoe for the first time. On one attempted turn I over-steered a little and drove straight over my tricycle. Looking at my crumpled handlebars he decided to wait until I was a little older before offering lesson number two. My dad grew up way too fast himself. He was born in the Netherlands in the 1930s. For most of his childhood his country was under German occupation. Many of his formative years were impacted by the epic events of World War 2. I remember his stories about when he was young – especially the stories about the war. And those Canadians! How he loved those Canadians for liberating his country! In the 50s, at the age of 19, he immigrated to Canada looking for opportunity and blazing a trail for the rest of his family to follow. His family never came. He stayed. He found work as a truck driver, a lumberjack, and a farmhand before starting his own home improvement company. He founded Bouwman Contracting, the company where my brothers and I all learned to work with concrete. The yellow brick house we lived in, the only house I lived in until I reached adulthood… he built that too. With his bare hands. When he would return home from work each night he’d walk in the back door of that house, go to the kitchen, grab my mother around the waist and plant a big kiss on her. He loved that woman. Saturdays were nearly always spent working in the yard, hauling water and washing the car for Sunday. My dad was very zealous about having a clean car on Sunday. When Sunday came he would take us to church in it – twice! Between services my dad would sit in his favourite recliner in the living room reading. He may only have had a grade 7 education but he sure made up for that by reading. His ongoing education helped him in the various roles in which he served his community either as an elder at our church or as a member of the local school board. He was a lifelong student of history. Many visitors to our house sat and listened with rapt attention as my dad would spin a yarn that wove historical facts and famous characters together with personal tales of adventure. The tales were tall at times. When they got too tall my mother would call him to help her in the kitchen. I remember him sitting on a stool in the middle of our small kitchen peeling apples, pears, peaches, potatoes…. I was right impressed with how fast he could “clean up” an apple with his black-handled jackknife, which he always kept razor sharp. Despite how busy he must’ve been, I remember that my dad was always there for breakfast and supper to lead dinnertime devotions and break up heated arguments from his seat at the head of the table. He also made time for play. In the summer we would often go boating on Lake Ontario. Summer vacations were spent navigating the Trent-Severn Waterway aboard his boat. In the winter my dad would take me to the Boat Show, the Sportsman Show and the Royal Winter Fair down at Exhibition Place. 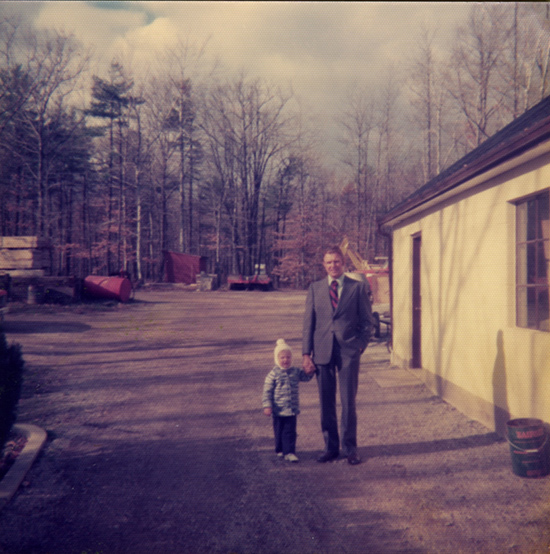 When he went out, my dad was a sharp dresser in a 3-piece suit and polished shoes. But during the week he wore work boots, green work pants and a plaid shirt. Paul Bunyan wore something similar, which I thought at the time seemed appropriate for a guy who was hoping to be as strong as my dad someday. What you couldn’t see was the big red handkerchief in my dad’s pocket. He’d clean his knife with it. Wipe the dipstick with it. Blow his nose in it. One day I slipped off the ladder in our garage and smacked my head on the bumper of our car. I screamed as blood spurted out of my forehead with each pounding heartbeat. In a split second my dad was there, whipping out that hanky and applying pressure to the wound. I’ll never forget the comforting feel of that thing against my face. This wasn’t the only time my dad would come to my rescue. One evening in December 1979, when I was about six years old, my brother and I had a bit of a mishap with some matches and some gas. 25 gallons of gas to be precise. The drum exploded and drenched me in ignited fuel. By the time my brother smothered the flames I had sustained third degree burns on my face and hands. My dad showed up, scooped me up in his big arms, laid me in the back of his car and drove… no flew… to Joseph Brant Memorial Hospital. I’ll never forget that ride. He was possessed. I think he went straight through the parking barricade at the entrance not stopping once until I was safely in the emergency room. My dad didn’t always get it right. He once had to bring my mom to the hospital. Labour pains. Burlington didn’t have a hospital at the time. It was necessary that he take her to Hamilton. He must not have given himself enough time though because when it was time for my sister to be born, I’m told, he was still driving up one side of the Skyway bridge. So my dad pulled his truck over to the side of the road and delivered that baby himself right there on the bridge. Fellas, I defy you to top that. He taught me how to blow my nose with nothing but my thumb. He taught me how to read maps and how to communicate using the phonetic alphabet. He taught me to pray. He could tell a great joke and deliver a mean Scottish accent. He could also deliver a well-placed kick in the rear end if that was what I needed. I could go on. In rare quiet moments he loved to sit by the fire. Sometimes he’d pull out his harmonica and play a tune. At Christmas time too, he’d sit by the fire and hand out the presents. I think he was really hoping I would follow in his footsteps because his gifts to me were things like hand planers, coping saws, screwdrivers and chisels. Last month, a few weeks before Christmas, my mother called me to tell me he wasn’t well. I cancelled a flight I had scheduled, asked my staff to cover for me and went to his bedside. When I got there I had time to say “Thanks dad. You were one of the good guys. You did a good job.” And being able to say that in all honesty is one of the best gifts my dad gave me. The beginning of a new year is an exciting time. It’s a time of anticipation. We return to our work with renewed energy and sense of purpose. It’s a time of heady plans, resolutions and action. We wonder what the year will bring. We hope for the best. We work towards our goals and dreams. And through all that activity, all the choices and decisions we make and every word we utter, we’re writing a story that will be our legacy. My dad wasn’t perfect. But man, am I thankful for the parts that he got right. He left a legacy that I’m proud to share with you. I hope you’ll find some inspiration from his life as you embark on the adventure of this new year. I wish you the richest blessings in 2014.